The global office of the IFA Hotels & Resorts international group is head quartered in Kuwait with offices in Dubai.With a presence throughout Europe, Middle East, Indian Ocean region and Africa, the company now aims to enter other international markets such as the United States, Mauritius, Eastern Europe and the Far East. IFA Hotels & Resorts' successful listing on both the Kuwait and Johannesburg stock exchange indicates the international community's confidence in the group. 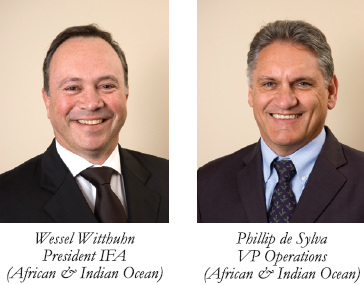 Locally, South African Wessel Witthuhn leads the ever-expanding African & Indian Ocean operation. Major IFA Hotels & Resorts' projects and investments in Dubai include Fairmont Palm Hotel& Resort, Fairmont Palm Residence, Crescent Resort, Al Nabat and Al Haseer shoreline apartments, the Palm Golden Mile all of these situated on Palm Jumeirah and the M�venpick Hotel & Residence Laguna Tower Dubai at Jumeirah Lakes. IFA Hotels & Resorts other projects include the Kempinski Alabadiyah Hills in Lebanon, a major stake in the Four Seasons Hotel in Beirut, the Zanzibar Beach Hotel & Resort, stakes in five Lonrho Hotels in Kenya and in the YOTEL hotels group, which owns two YOTEL hotels in Heathrow and Gatwick airports, United Kingdom. IFA Hotels & Resorts' products include vacation and shared owner-ship, lifestyle clubs, resort developments, residential developments plus travel and tourism services. Zimbali Coastal Resort and Zimbali Lakes Resort - IFA Hotels & Resorts shares a 50% joint venture with Tongaat Hulett (THD) in a 700-hectare prime residential and resort estate development located on the north coast of KwaZulu-Natal. 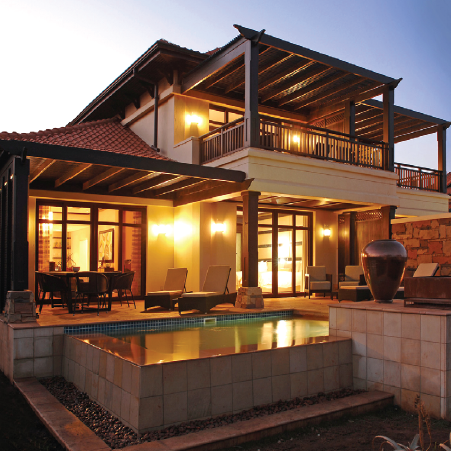 Fairmont Zimbali Lodge - IFA Hotels & Resorts owns the exclusive Zimbali Lodge, managed by Fairmont Hotels & Resorts. Fairmont Zimbali Resort - A new R1.2-billion hotel resort, with a unique portfolio of properties including Hotel Condos, apartments, ultra luxury villas, golf chalets and villas, including the internationally acclaimed Fairmont Heritage Place Private Residence Club, managed by Fairmont Hotels & Resorts. Boschendal (Pty) Limited - A mixed-use resort development on an historic Cape Estate. IFA Hotels & Resorts currently holds 32,08% equity. Legend Golf & Safari Resort - situated in the Waterberg area of the Limpopo Province. The Legend development includes part of the malaria-free 22000ha Big Five Entabeni Safari Conservancy. IFA Hotels & Resorts has a 50% stake in this development. IFA Hotels & Resorts is in the heart of the KwaZulu-Natal development focus, located 45 km north of Durban and within close proximity to all modern amenities - including several of South Africa's impressive 'Big Five' safari game parks and historic Anglo-Zulu battlefields. The prime location ensures ease of access to the Umhlanga Ridge new town centre and Gateway shopping centre, and the extensive range of amenities in the Ballito area. The new King Shaka International Airport at La Mercy (15 minutes away) will also increase the economic opportunities and tourism potential of KwaZulu-Natal's North Coast. IFA Hotels & Resorts' ability to form strategic alliances and joint venture partnerships with other leading groups drives much of the group's success. The partnership with Tongaat Hulett Development, a leading land development company in South Africa, created a synergistic partnership through which Zimbali Coastal Resort has grown into an internationally recognised premium resort and residential estate. Other strategic partnerships include Kingdom Hotel Investment Group (Saudi Arabia), Nakheel (UAE), Istithmar (UAE), United Investments Portugal, and a strategic alliance with RCI (part of the Cendant Group). Zimbali Coastal Resort has firmly established itself as southern Africa's premier vacation and residential resort destination. The unique feature is the eco-sensitive environment. Nestled between golden beaches and indigenous coastal vegetation, Zimbali is a place of natural beauty, endowed with an abundance of indigenous wildlife, which roam freely throughout the estate. The resort boasts 1,100 exceptional residential opportunities located within the coastal forest and seamlessly integrated with the surrounding Tom Weiskopf 18-hole signature golf course. Complementary to these exceptional features is the stylish Fairmont Zimbali Lodge, featuring 5-star luxury accommodation, health spa and a magnificent pool area amongst its facilities. Fairmont Zimbali Resort is the first internationally branded and operated five-star resort located along 3.5km of pristine beach in South Africa. The 154 luxuriously appointed rooms and suites complement a host of 5-star services and facilities delivered at the globally acclaimed standard of the Fairmont brand. The R4-billion Zimbali Lakes Resort development is a large scale, family orientated, lifestyle estate providing resort and residential living. Situated over an extensive area of pristine coastal property overlooking the Indian Ocean and undulating hills, the Zimbali Lakes Resort offers over 1,300 residential opportunities, a proposed Gary Player signature, 18 hole, par 72-championship golf course, plus a spectacular 22ha lake waterfront concept with surrounding residential, commercial and entertainment opportunities. Situated along the M4 highway, and only 15 minutes from King Shaka International Airport, the AAA grade Office Estate provides quick and easy access to the residents of Zimbali Coastal Resort, Zimbali Lakes Resort and the surrounding areas. The Zimbali Office Estate will yield a total of 15 sites and an overall development potential of just over 26,680sqm prime commercial office space within the first phase. A second Office Park, across the M4 highway and adjacent to the first Office Park, will be brought to market once the first phase has been sold out. IFA Hotels & Resorts has a long-term commitment to tourism and economic development in KwaZulu-Natal. The unique ability to bring diverse and unique product offerings tailored to local market demands further distinguishes them from their competitors. Looking ahead, IFA Hotels & Resorts will be evaluating other investment opportunities in South Africa's tourism industry, aswell as the commercial and investment sectors.